Gerry Dolezar’s History of the Regatta! Home/ Gerry Dolezar’s History of the Regatta! 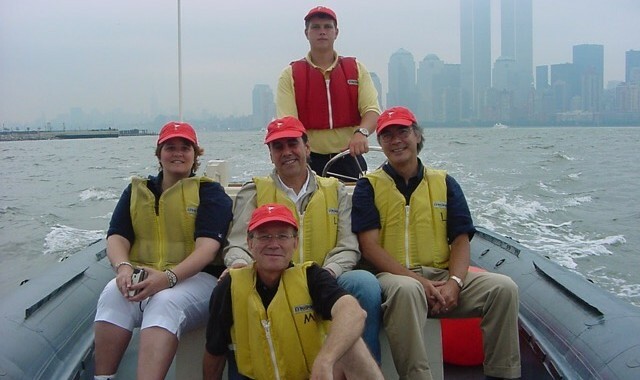 We asked Gerry Dolezar, founder of the Regatta, to share some thoughts and memories of the beginning and history of NYARC so far! The very first regatta was held on September 9th, 2001. 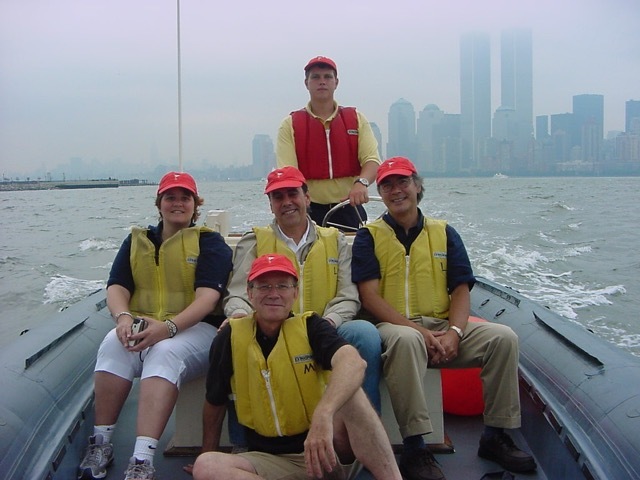 This photo shows Debbie Rizzo of SOM and George Chen of Gensler, Tony Rizzo of Rimi Woodcraft and myself, on the inflatable with Thomas the skipper on our way to the race course with the twin towers behind us. There were monsoon rains all day long and everyone was calling asking if we were going to have a regatta. I told everyone to come down to the marina and we would decide on the docks. At 5:30 the rain stopped, the wind came up, and we had our first regatta, with Chris Choa of HLW as the winning boat. Multiple teams over the years won the first time they raced, which included Jim Burge and team HOK. It was also his first year at HOK. I also remember standing on the street telling Jonathan Marvel about the regatta, he decided to race, and he won his first year. I think Dan Allen won his first year as well. Bruce Fowle of Fox and Fowle and Todd Schliemann of Polshek Architects both came in 2nd place so many times I felt guilty that I didn’t name the regatta after them. After Polshek changed their name to Ennead, they finally won. Then there was the year we had 30 knots plus of wind, which was very exciting. Multiple teams came out to race, realized they were over their heads, and went straight back to the dock. It was a little scary to just watch – even experienced teams had problems. A few almost broached and team Ennead rounded up right in front of the race committee and hit the Willy Wall. Because there was so much wind, Michael Fortenbaugh decided one longer race instead of two, and after the rounding, started pulling the last boats out of the race and sending them back to the docks. We ended the race without any injuries but with the best pictures of the regatta so far! I originally started the regatta to meet architects so I could sell them products! But I’ve ended up making multiple friends, having lots of drinks and laughs, wet and dry, and wonderful memories. For me the regatta has been one of the great experiences in my life.